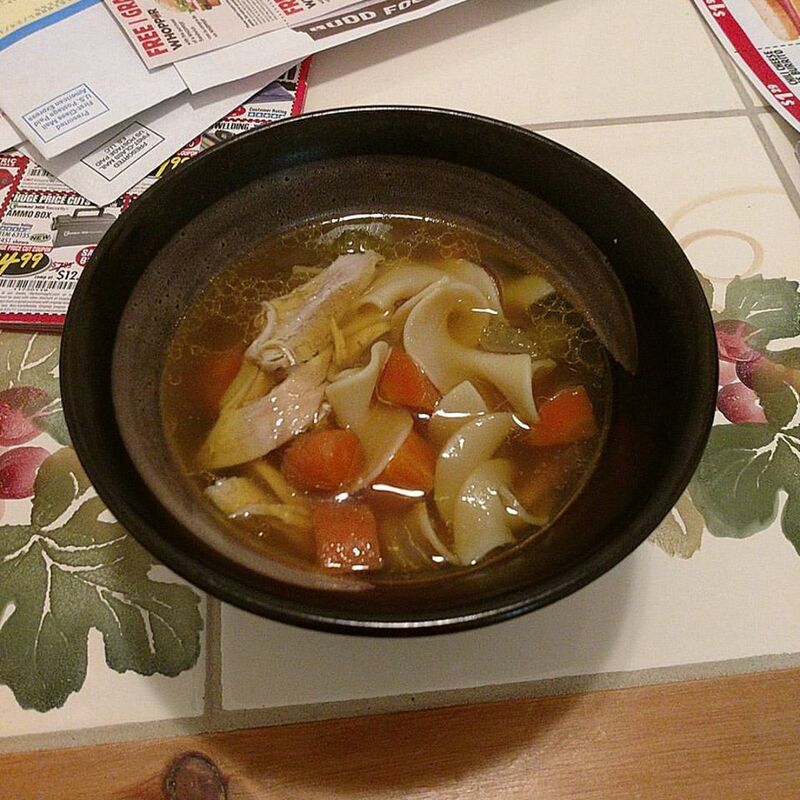 Super easy chicken noodle soup recipe! Just follow the recipe. Fair warning that you’ll have a lot of chicken meat. Either save the meat and use it for a different recipe, or consider getting a smaller chicken and supplementing with chicken bones or chicken broth. 5 carrots, peeled and sliced into 1/2 inch pieces KB: Too much carrots. The broth tastes more like veggie soup than it does chicken. Will try 3 carrots next time. 2 celery sticks, sliced into 1/2 inch pieces KB: I like celery. I will do 3 celery sticks next time. KB: Notes: Here’s the original recipe from No. 2 Pencil I’ve added my notes in bold. I’ve been spoiled with Pho Ga growing up, so I tend to like my chicken noodle soup with prominent Chicken flavors. Easily serves 5-6 people. Turn off Saute function, lock Instant Pot lid in place, make sure pressure valve is set to sealing and set Instant Pot to High Pressure for 20 minutes, via manual mode. 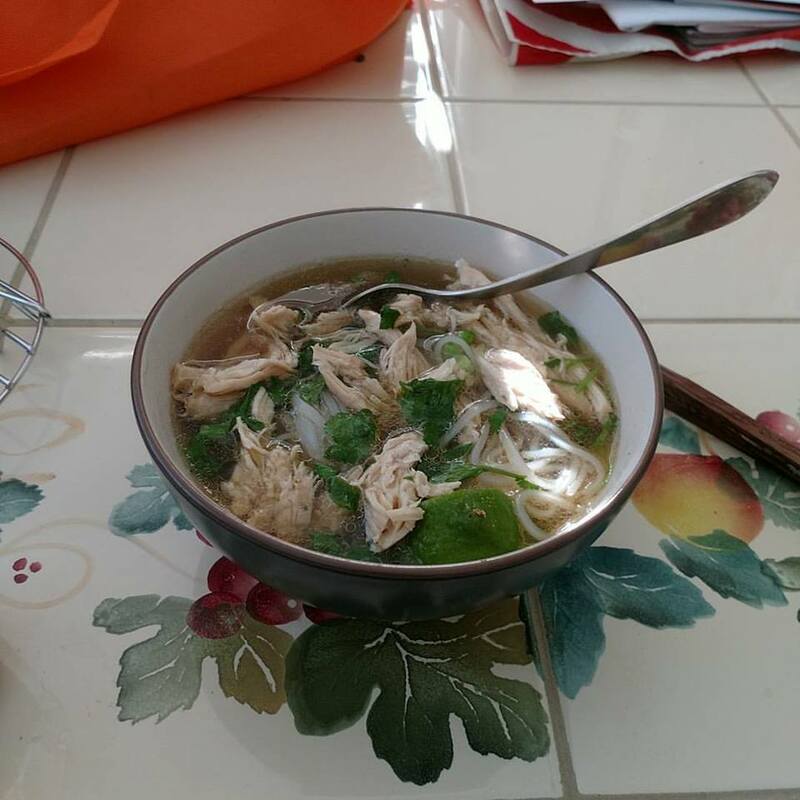 KB: As the broth didn’t really bring out the chicken flavor, I would recommend running the Instant Pot for a little longer. I ran mine for 25 minutes. Remove whole chicken and set aside to shred. 4 bone in chicken breasts KB: Bone in is important. If you find that you don’t have enough flavor, you can also buy chicken bones by itself. I also found that 4 chicken breasts left me with way too much chicken. My second attempt was with 1 chicken breast with rib bone and 2 carcasses of chicken bones. 1 onion KB: I used a yellow onion. ¼ cup fish sauce plus to taste KB: Use 1/2 cup. Taste your broth before serving. You’ll need to add a little fish sauce and/or salt to the broth in order to get it to the flavor/taste you are looking for. Don’t be afraid of adding too much though. Like Cuong said, the noodles will dilute the broth and flavor. 2 TBS sugar (preferably palm sugar) KB: Use 1 tablespoon instead of 2.
packet of pho spices (can omit) KB: This was one of the items available at my local Asian Market. $3.00 for 5 spice packets. The filter bag becomes really fragile after the cooking process. Use a ladle to remove the packet as to not break the spice bag during removal. Over direct heat gas flame, char the whole onion and ginger, 5 minutes. If a gas burner is not available, you can use a dry pan on the stove, broil in the oven, or use your outdoor BBQ grill. Place chicken, fish sauce, sugar, charred onion and ginger, salt, and spice packet into Instant Pot and fill with hot water (can use cold, it just takes longer to heat up). Close lid, set vent knob to Sealing, and use Manual for 20 minutes. KB: Try to use hot water if possible. It will save you a lot of time. We also found the chicken to be a little bland. Consider preparing the chicken ahead of time by seasoning with some salt and pepper. After 20 minute cook time, you can QR (Quick Release) or NPR (Natural Pressure Release). Taste and season broth. KB: I ended up cooking on Manual for 25 minutes. I also don’t think it hurts to let the broth sit after cooking. I feel like the flavors really start to settle in more the longer you let it sit. My only recommendation is to remove the spice packet with a ladle as I think the packet will become more prone to breaking. According to Cuong, you want the broth to be a bit more flavorful than what you like. When you add the rice noodles into the soup, it will dilute the flavor a little bit. This is very much true! In a separate pot, boil some water, Using a noodle strainer if available, boil the dry pho noodles about 5 to 20 seconds until it is loose and pliable. Place into soup bowl. KB: I was told to wash the noodles again after cooking it. Something about a better taste. Garnish with green onion and cilantro, pour hot soup broth into bowl KB: If the noodles are cold, consider microwaving the bowl for 30-45 secs prior to adding the broth. Stay lubed during all steps of the cooking process!